You will not have missed the trend. Choose your example from the last 12 months: Federer in the Wimbledon final aged 33; Wawrinka winning the French Open aged 30; Feliciano Lopez achieving his career-high ranking of 12 aged 33; Estrella Burgos breaking into the top 100 for the first time aged 34; the 2014 year end top 100 containing 30 players aged 30 or over; or from February this year, when Karlovic, Ferrer and Simon, each over 30, won ATP tour titles on the same day. The list goes on; and what may appear at first as anomalies are in fact anything but. This post summarises the facts behind ageing on the ATP tour. 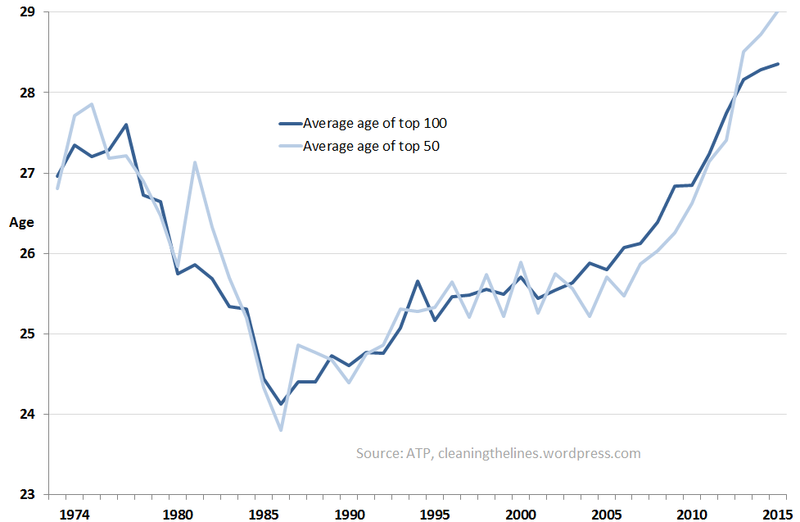 In 1973, the era of Laver, Ashe and Newcombe, the average age of the top 100 was a shade under 27 years of age. The average age remained at about 27 until around 1980 when it dropped precipitously for the next few years to just over 24 years of age. In 1986, Boris Becker won his second Wimbledon at just 18; Pete Sampras would win the US Open in 1990 aged 19: tennis was a young man’s sport. Grand slams and acne. After 1990, the needle marking the average age of the top 100 ticks upwards, unevenly but seemingly inexorably. 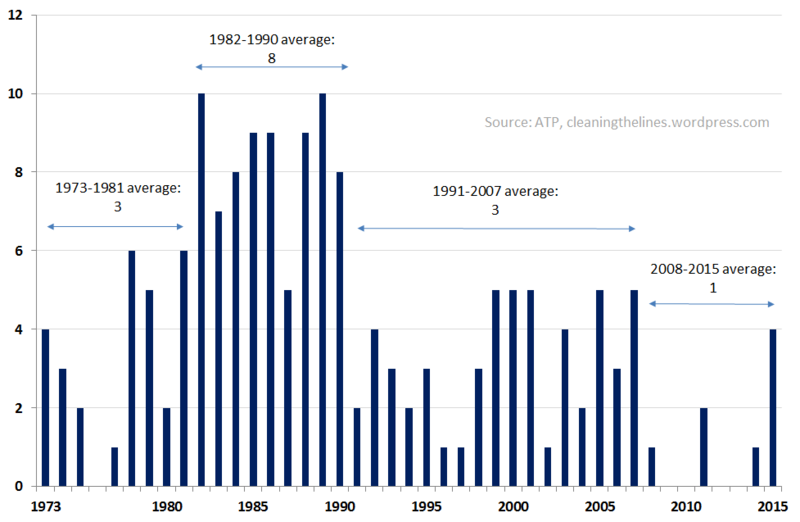 The average age of the top 100 hit 25 at year-end 1993 and has not fallen back since. 26 was hit in 2006, 27 just five years later in 2011, 28 in 2013, with last year’s 28.3 the highest average age yet, including the early 1970s. The cycle of the top 50 has been more acute: the average age at year end 2014 was almost 29. See chart below. There were 10 teenagers in the Top 100 in 1989, more than twice the total number between 2008 and 2014. The ageing profile of the top 100 is perhaps why there has been so much focus on the likes of Kyrgios (aged 20), Coric (18) and Zverev (18). For sure they are new exciting talents, but part of their attraction lies in their current day rarity: Kyrgios was the only teenager to finish inside the top 100 at year end in 2014. Coric finished just outside and Zverev at 136. In fact Kyrgios was the first teenager to finish a year in the top 100 since 2011 (Ryan Harrison, Bernard Tomic) and was only the fourth since 2008. A rare achievement and therefore one that marks Kyrgios out for the top? Well, yes (two grand slam quarter finals so far) and no (the jury is out on both Tomic and Harrison) and not so fast: while the last 7 years (i.e. since 2008) confers “second coming” status on any teenager finishing in the year end top 100, such an achievement used to be commonplace. In the six years between 1985 and 1990 (inclusive), there were a total of 50 teenagers in the year end top 100 including 10 at the end of 1989 alone. To reiterate, this is compared to just 4 in the last seven years. Accordingly, back in the 1980s, it was not uncommon for a top 100 teenager not to make the top 10. Of the 10 teenagers in 1989’s top 100, yes 3 would become year end number 1s (Agassi, Courier, Sampras); another 3 would finish at least one year in the top 5 (Bruguera, Chang and Ivanisevic); the remaining 4 would have career-high year end rankings of between 14 and 35 (Rosset, Stoltenberg, Cherkasov, Davin descending). The fortunes of the class of ’89, so to speak, present a balanced view of someone like Kyrgios’s potential: a chance at being a great player but by no means a certainty. A heady mixture of his rarity, his personality and media hype has created a hero/villain caricature. Putting events in Montreal to one side, the fairer thing would be to give him a break, and not just because he’s only 20 and not just because it’s only tennis. It’s because based on the class of ’89, there’s a 40% chance he won’t make the top 10. But we’ll get to how career ranking trajectories have changed in a couple of paragraphs. Between 1980 and 2002, a player typically broke the top 100 for the first time aged 22. Since then, the average age has been 24 years old, and in 2014 it was 25. Breaking through is breaking down: players are now playing, on average, for 3 years longer before breaking into the top 100. 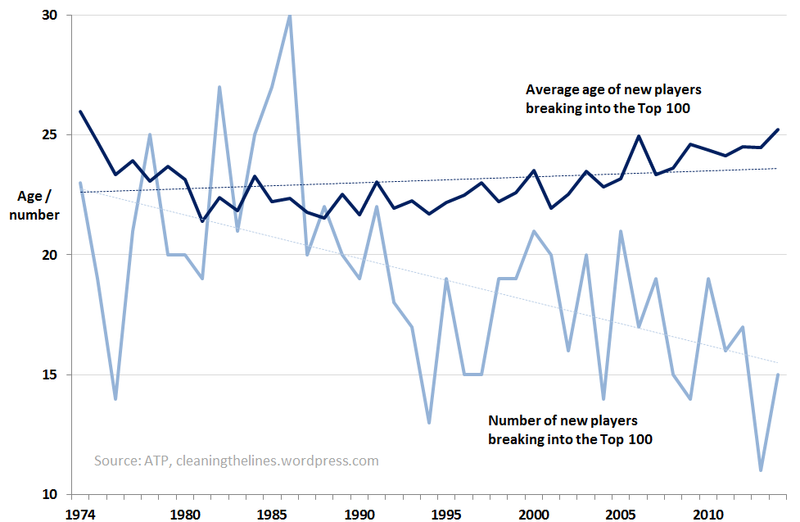 As the average age of the top 100 has increased and as it takes longer to break through, so the number of new players in the top 100 each year has fallen since the mid-1980s. See chart below. Who’s calling a 30 year old a veteran? More than 1 in 5 players are now reaching a better year-end ranking in their 30s than ANY year in their late 20s. Recall from above that a player will now typically break through aged 25, older than the typical “peak” age for players playing in the 1980s. Players are remaining at the top of the game for longer. More players are playing into their 30s than ever before. The likes of Kohlschreiber, Feliciano Lopez, Seppi, Simon, Verdasco, Wawrinka and others have been in the top 100 for over 10 consecutive years. Crucially, the data shows the current crop of players have a better chance of recording higher rankings in their 30s than before. Following his defeat to Roger Federer in the Wimbledon 2015 semi-final, Andy Murray was asked by a journalist to describe the autumn of Federer’s career considering that “most people are not doing what he’s doing” at his age. Murray replied that “there’s very few players that have been able to do it on the men’s side. Obviously Agassi played some great tennis into his 30s. Jimmy Connors is another one that played well late. I don’t know if anyone’s played as well as Roger maybe at that age.” Current career trajectories suggest that may well change. A player born in the 1950s had a 36% chance of finishing a year in their 30s with a ranking better than when they were aged either 27, 28 or 29. The same chance for a player born in the 1980s is 49%. Similarly, a player born in the 1950s had a 13% chance that they would have a year in their 30s that was better than each of the last three years of their 20s. Fast forward a generation: that number is 22%. See table below. It’s not clear how long the upward trajectory can outrun biology. In 2 or 3 years, will the average age of the top 50 be 30 or 31 years old? A slight glimmer of hope: if rankings remain the same, there are due to be 4 teenagers in the top 100 at year end, the highest number since 2007. At the moment, they feel like anomalies. So let’s recap: players in the top 100 are getting older, they’re taking longer to break through and taking longer to reach their best rankings; and a teenager is a rarity in the modern day. The question clearly is: why is this happening? All references to year-end rankings are to the calendar year end, i.e. as close to 31 December as possible. It is noted that the calendar year-end can clash with the official ATP year end which can occur before, for example, some Futures events that take place in December. Rankings taken following Wimbledon 2015. August 21, 2015 in Ageing. Please send me your email. Great job with story and very interesting.